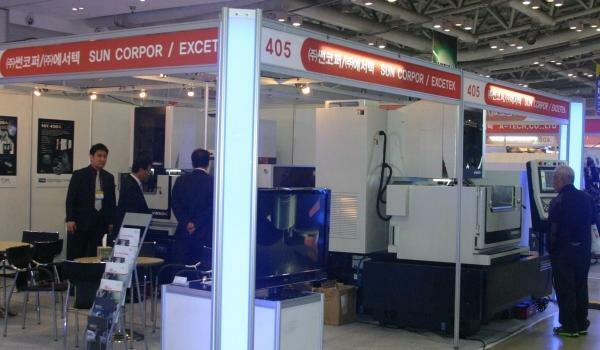 November sixth 2013 marked the opening of the most recent International Machine Tools & Parts Fair hosted at the Changwon Exhibition Convention Center, in Changwon, South Korea. MATOF, as it is referred to for the sake of brevity, is an exposition of the latest and greatest in the field of industrial technologies. Since its inception, MATOF has played host to a wide range of exhibition items ranging from CNC mills to mechanical lubricants. Despite the fact that only two such exhibitions have taken place, MATOF is anything but fledgling, proving to be a hit with companies looking to fill their particular niche market, and Fill it they do. The plethora of products is divided into six main categories, each with a number of sub groups. The glut of products fall into the “cutting machine” category with sub categories focusing on more specific technologies such as water jet and laser cutters, CNC milling, and tapping machines to name a few. Regardless of specific categories, it is clear that the general trend is towards smart manufacturing. Smart machines offer more than just precision and automation, in fact their most alluring benefit proves to be the lack of scaling costs that have, in the past, required a prohibitive upfront investment if one wished to see returns. With comparatively little investment, people with innovative ideas can, not only prototype, but begin production runs in a matter of days. With this in mind, it is little wonder that MATOF has set its sights on this niche, a niche that will likely eschew that title in the coming years as the economic benefits are proven the world over. The Asian financial crisis of the late nineties may as well be ancient past, for in Changwon, South Korea’s epicenter of manufacturing technology, business is clearly booming. The four-hundred thousand Won worth of iPad Minis to be given away at the event is testament to the sort of lengths gone to incentivize already high attendance. This comes as no surprise given the tremendous implications this trade-show could hold for the nearly thirty-six hundred related companies in the region and the economy of the nation as a whole. An economy that is sure to be further stimulated as technology begins to allow lone innovators to more easily grow their ideas into companies vital to the economy of the nation and globe. The success of MATOF looks only to increase in the coming years, as its unique growth strategy aids South Korea in further strengthening its economic relations in the global marketplace. Starting next year, this growth strategy is focused primarily on encouraging international companies to attend and organize into specific areas based on their country of origin. These areas will highlight the culture and people of a nation in addition to the typical MATOF fair. This approach creates an environment that fosters precisely the sort of global industry that is symbiotic in nature, rather than the parasitic nature of outsourcing to cut costs, which is currently the accepted norm. MATOF has again proven its value in the modern global economy, not simply due to the nature of the products on display, but also in fostering the building of a strong international foundation in preparation for the massive paradigm shift that has just begun in the world of industry. Find great deals on used versions of these machine tools here.